MINNEAPOLIS -- Since millennials are more likely to be frequent convenience store shoppers than the over-35 crowd, c-stores are especially looking to meet the needs of the millennial generation. "One way to win the millennial dollar is by taking inspiration from competing channels, delivering the variety and quality of competing foodservice venues without sacrificing the convenience that's so critical to this consumer," said Lindsey Shepherd, consumer insights researcher at General Mills Convenience & Foodservice. "Opportunity also exists around breakfast, better-for-you alternatives and an expanded grocery section." 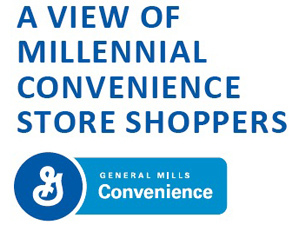 General Mills Convenience & Foodservice recently conducted a survey to uncover the perceptions and desires of millennial c-store shoppers. The company surveyed 474 c-store food and beverage shoppers, ages 18 to 64, in an online survey in Jan. 2014. The study focused on the differences between millennials (18 to 34) and shoppers over the age of 35. Overall satisfaction is high among c-store shoppers, the survey found. Nine in 10 report they are satisfied with the store experience today. 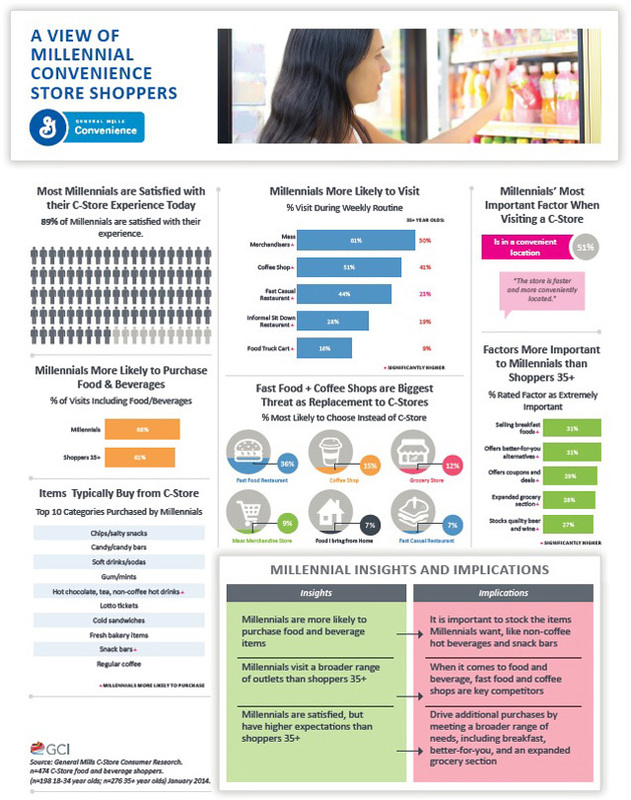 Millennials (53%) are more likely to be frequent c-store shoppers, visiting a store daily or weekly, than shoppers over age 35 (47%). Millennials are more likely to purchase food and beverages during trips to a c-store; 66% of their visits include food and beverage purchases versus 61% for shoppers over 35. Millennials visit mass merchandisers, coffee shops, fast-casual restaurants, informal sitdown restaurants and food trucks more frequently than shoppers over 35 in their typical weekly routines. Millennials cite fast-food restaurants (36%) and coffee shops (15%) as their top alternatives to c-stores for food on-the-go, making these channels the biggest competitors for the millennial food dollar. They cite fast-food restaurants as a top alternative for quick/easy, drive-thru and variety of options; coffee shops for quality of food, coffee/iced coffee and variety of options. Availability of breakfast foods: 31% (versus 23% of shoppers over 35). Better-for-you alternatives: 31% (versus 20% of shoppers over 35). Coupons and deals: 29% (versus 21percent of shoppers over 35). Expanded grocery section: 28% (versus 19% of shoppers over 35). Quality beer and wine selection: 27% (versus 20% of shoppers over 35).